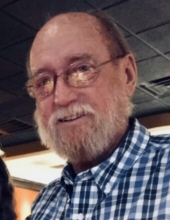 Tommy David “Tom” Mitchell, age 65, passed away February 3rd, 2019. Tom was born on August 17th, 1953 in Abilene, TX. Tom is survived by Brenda, his loving wife of 40 years; daughter, Sara Kluczynski and husband Johnathan; grandson, Jace Kluczynski; mother, Myrtle Mitchell; sister, Judy Brewer and husband William and many nieces, nephews and cousins. Tom is preceded in death by his father, U.H. Mitchell; brother, Walton Henry and his wife Jenell. Memorial services will be held privately for close friends and family. "Email Address" would like to share the life celebration of Tommy David Mitchell. Click on the "link" to go to share a favorite memory or leave a condolence message for the family.